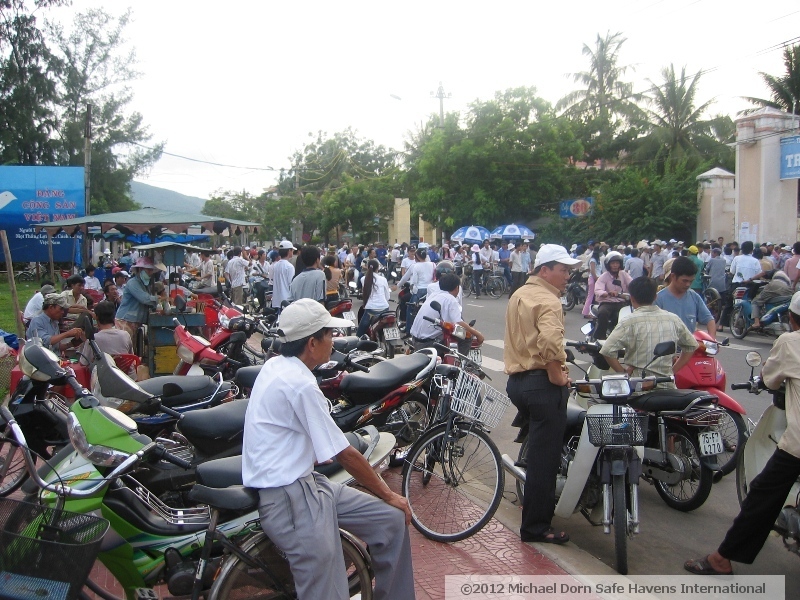 This photograph taken by the author in Quinhon, Vietnam depicts several thousand Vietnamese parents, aunts, uncles, grandparents and other family members waiting in the heat for most of a day while their students sit for college entrance exams. As the test results will not be available for about two weeks, their presence is to demonstrate to the students that education is important and that their family supports their efforts. 47-year-old Tuan Huynh plead guilty to a charge of child endangerment yesterday. Huynh left his 16-year-old daughter at the Cheltenham Square Mall in Pennsylvania because she made a grade he considered to be unsatisfactory on a calculus test. Fox News affiliate WTXF-TV reported that he told his daughter that she no longer met her parent’s expectations due to the grade. Prosecutor Cara McMenamin told reporters that the young lady wandered around the mall for approximately four hours before a minister approached her and learned what had happened and notified authorities. The court sentenced Huynh to attend parenting classes, to serve 100 hours of community service and two years on probation. The prosecutor stated that Mr. Huynh showed no remorse for his actions. There are aspects to this case and to the behavior of Ms. Diane Tran in the highly publicized Texas truancy case that are not surprising to me being married to a Vietnamese and having spent considerable time in Vietnam over the past seven years. Working with school officials in Vietnam and having visited many schools there, I have noted a number of stark contrasts with our schools and culture. Though by far not all Vietnamese could be described this way, I feel pretty comfortable stating that many Vietnamese parents and students exhibit an extraordinary focus on education. My wife is now working on her third graduate degree after graduating with a 3.93 GPA for her second masters at Texas Tech University. About halfway through her current degree she is maintaining a 4.0 GPA by dedicating about 40 hours per week on her studies while working on average about 60 hours per week and raising a child. As she has told me numerous times, she does not attend school to make B’s. She also feels that it is important for her to truly learn any subject she studies so she works far beyond what is required to make a top grade in her effort to master her subjects. My suggestions that she reduce her study time to achieve balance in her life are dismissed offhand. I can understand how Ms. Tran can hold down a full-time job, a part-time job and maintain her status as an honor student. I can also understand how she maintains that she does this in part to support her family members because I have seen many examples of this in my wife’s family. Her niece completed a BA in New Zealand and an MBA in Australia and now sends home much of her paycheck each month to help repay her parents for all of the money they invested in her education. This in turn can help them fund a college education for her younger sister. While not all Vietnamese have this dedication to family and education, there is a very noticeable trend for these types of priorities in Vietnam and in Vietnamese Americans. If you look at the photo and caption with this story, I submit that the reader consider if there would even be the need for a term such as AYP if this significant a percentage of American parents found the education of their children to be so critical. While like people from any culture, Vietnamese Americans must conform to our legal system, it may help some readers to understand the cultural factors that are likely at work in these two cases. Many Vietnamese in Vietnam and in other countries still view a superb education as the way to a decent standard of living. Though Vietnamese society is rapidly changing, there is a pervasive hunger for education that is far different than what is the norm in the United States.